“America’s Finest News Source,” shares how it manages its fonts with Universal Type Server, their font management best practices and more. 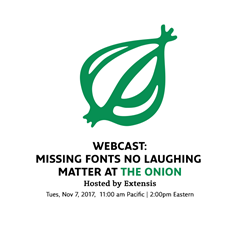 Extensis®, a leader in font management and digital asset management solutions, will host a live Webcast with its customer The Onion discussing how the satirical news source manages the fonts used in its work. Following the presentation, Livingston and Jim Kidwell of Extensis will be available for questions. A recording of the webcast will be sent to those who register, but cannot attend. Extensis empowers designers, developers and enterprises across the globe with the font management tools they need to control corporate typographic branding. Universal Type Server is the world’s leading font server, offering the most effective solution for helping enterprises manage, organize, and distribute their font collections and ensure font compliance. © 2017 Celartem, Inc. d.b.a. Extensis All rights reserved. Extensis and the Extensis logo mark, Suitcase Fusion, Suitcase TeamSync, Extensis Portfolio, Portfolio NetPublish, Portfolio Flow and Universal Type Server are trademarks or registered trademarks of Extensis in the United States of America, Canada, the European Union and/or other countries. This list of trademarks is not exhaustive. Other trademarks, registered trademarks, product names, company names, brands and service names mentioned herein are property of Extensis or other respective owners.